30 day replacement warranty. No refunds on this item. 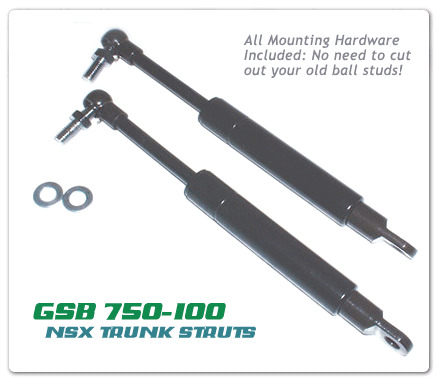 The new GSB 750-100 trunk struts are very strong and the finish is excellent, with an appearance very similar to oem. These have 20-30 lbs. more compression force than other aftermarket brands, and are almost identical to oem with the exception of length. They are approximately 1/4" shorter, allowing for easier installation. Comes complete with steel ball sockets, metric ball studs, loop end connectors and washers - no need to cut your old studs out! Self-contained nitrogen-driven counterbalance for uniform force and non-catastrophic failure. Barrel length: While shorter overall, the GSB cylinder barrel is slightly longer than oem. What this means is that you won't be able to secure the top fastener of your wiring clip after install. A very simple solution is to make a straight cut across the clip and lose the top piece. The clip fits very securely with just the bottom fastener, and any casual observer would not know it had been altered. International shipping also available. I usually ship within 24 hrs. of verified payment, subject to stock availability with tracking. APO/FPO military ships at same price as domestic. Defective struts will be replaced with identical units if returned within 30 days of purchase - sorry, no refunds on this item. Returns will ship at your expense, and replacements will ship at my expense. Please remember to leave f/b if you are satisfied with your purchase. Thanks for looking!